Dissent or Terror: Counterterrorism Apparatus Used to Monitor Occupy Movement Nationwide | Democracy Now! editor and publisher of The Progressive magazine. He wrote the cover story for the June issue of the magazine, “Spying on Occupy Activists: How Cops and Homeland Security Help Wall Street.” He is also the author of You Have No Rights: Stories of America in an Age of Repression. 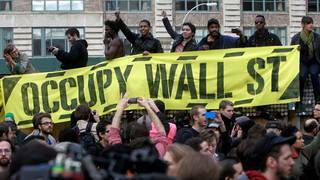 Newly revealed documents show how police partnered with corporations to monitor the Occupy Wall Street movement. DBA Press and the Center for Media and Democracy have obtained thousands of pages of records from counterterrorism and law enforcement agencies that detail how so-called fusions centers monitored the Occupy Wall Street movement over the course of 2011 and 2012. These fusion centers are comprised of employees from municipal, county and federal counterterrorism and homeland security entities, as well as local police departments, the FBI and the Department of Homeland Security. Click here to see our extensive coverage of the police crackdown of the Occupy movement. Read full report on government surveillance of Occupy movement by the Center for Media and Democracy / DBA Press. AMY GOODMAN: Matt Rothschild, it’s great to have you with us, editor of The Progressive magazine. And he did this very interesting story, a cover story for June issue of the magazine, “Spying on Occupy Activists: How Cops and Homeland Security Help Wall Street.” Can you compare what you have found—and start off by saying why Phoenix. Why did you focus on Phoenix? MATTHEW ROTHSCHILD: Well, I focused on Phoenix because the primary researcher for this story, Beau Hodai of DBA Press and the Center for Media and Democracy, had compiled tremendous amounts of information. He had issued Freedom of Information Act requests from the Phoenix Police Department, from the Arizona Counter Terrorism Information Center. And so, he got thousands, literally thousands, of pages of information, primarily about Phoenix and Arizona, but also some national context. But I thought by focusing on this one city, you could really tell, at the most granular level, how police officers and Homeland Security are really going after left-wing activists. And I thought it was important to really focus in narrowly, because I think those narrow details really give a clearer picture of just how hand-in-glove local law enforcement is with the private sector in going after these Occupy protesters. AMY GOODMAN: How does this compare to the IRS monitoring tea party groups or, you know, sort of specially targeting them for deciding whether they should get nonprofit status? MATTHEW ROTHSCHILD: Well, I thought it was outrageous what the IRS was doing in that Cincinnati office. But this, to me, is much worse because, whereas the IRS office in Cincinnati, that may have been, you know, a bureaucratic mistake or bungling or lack of supervision, what’s going on with the spying on Occupy activists was a systematic effort by police departments, not just in Phoenix, but around the country, with Homeland Security, to track the Occupy activists—and to coordinate a response, even. One of the documents that Beau Hodai released, from the Center for Media and Democracy and DBA Press, was a file—a report on a teleconference that 13 police departments around the country had as to how to respond to Occupy, what they called “growing concerns” about the burgeoning Occupy movement, and that they needed to coordinate an effective response. And so, you know, when we had that crackdown on Occupy simultaneously over a weekend in many different cities, I wondered at the time whether there wasn’t coordination going on between the police departments to crush the Occupy movement. And this suggests that there was. NERMEEN SHAIKH: Matt Rothschild, you also speak specifically about the way in which protests against the NDAA, the National Defense Authorization Act, occurred. Could you elaborate on that and why that was a particular focus of law enforcement? MATTHEW ROTHSCHILD: Yeah, there’s documents, again, that show that police, from the U.S. Capitol Police all the way to the Phoenix Police Department, were monitoring protests of the National Defense Authorization Act. The National Defense Authorization Act allows the president of the United States to grab any single one of us and throw us into jail and deny us due process and access to a judge for as long as the president says so. And so, this is a huge clampdown on our civil liberties, and people should be protesting it. And it’s ironic that people trying to defend their civil liberties are having their civil liberties violated at the same time. AMY GOODMAN: Matt Rothschild, explain what these fusion centers are and how they work, both with public law enforcement and with private companies. MATTHEW ROTHSCHILD: Well, this is a real problem I have with fusion centers, Amy. Fusion centers are—in each state, there’s a fusion center. And the fusion center is supposed to represent law enforcement at every level, from, you know, campus police to city police, to sheriffs, to the FBI and state police. But also, within these fusion centers, there are representatives of the private sector. And there’s also an organization called InfraGard in these fusion centers. Now, InfraGard is an association of more than 50,000 business people with the FBI. They’re essentially FBI minders, with these business people in each state. And sometimes these business people get information from the FBI even before elected officials get it. And also, the FBI tells these business members of InfraGard, “Hey, if you ever have a problem with an employee, just let us know.” And so, you know, is this the kind of collaboration we want? That a boss, who doesn’t like what you’re doing on the workplace—maybe you’re forming a union, the boss calls the FBI, and then what? The FBI opens a file on you? We need to be careful of this institution called InfraGard, too, which was part of the Arizona fusion center, by the way. AMY GOODMAN: Matt, we want to thank you for being with us. Matt Rothschild, editor and publisher of The Progressive magazine, wrote the cover story for the June issue of the magazine, “Spying on Occupy Activists: How Cops and Homeland Security Help Wall Street.” The piece draws heavily on documents obtained by the Center for Media and Democracy and DBA Press. Matt Rothschild is also author of You Have No Rights: Stories of America in an Age of Repression.